The key services offered by BioC, span across the pillars of Assessment, Design and Progression. BioCultural has a strong planning capacity, focusing on detailed discussions with clients on individual expectations, components and scale of projects or partnerships. Cultural sensitivity by the BioCultural team has built extensive relationships and trust with Traditional Owner groups. Our communication and engagement across all Indigenous knowledge levels allows self-determining protocols of Indigenous peoples' to direct negotiations with external parties. The Company philosophy is the provision of the highest quality cultural capability services in accordance with relevant standards and codes of practice. Focusing on the collaborative development of sustainable Indigenous and non-Indigenous business partnerships. BioCultural has a strong planning capacity, which focuses on detailed discussions with the client to set the individual expectations, components and scale of projects or partnerships. BioCultural creates thematic design and cultural mapping tools using visual software. Expertise in GIS and spatial system approaches was gained through collaborative planning and development of the Dujul Jambula ('Bringing two approaches together') web-based spatial system with computer program specialists. Use of John Locke's cultural and intellectual knowledge was a critical element in the development and design of the system. The Queensland Parks and Wildlife Service used this intellectual knowledge to further develop its statewide ParkInfo System. Cultural sensitivity by the BioCultural team has built extensive relationships and trust with Traditional Owner groups. Communication across all levels of Indigenous knowledge determines the protocols that direct Aboriginal peoples' negotiations with outsiders. 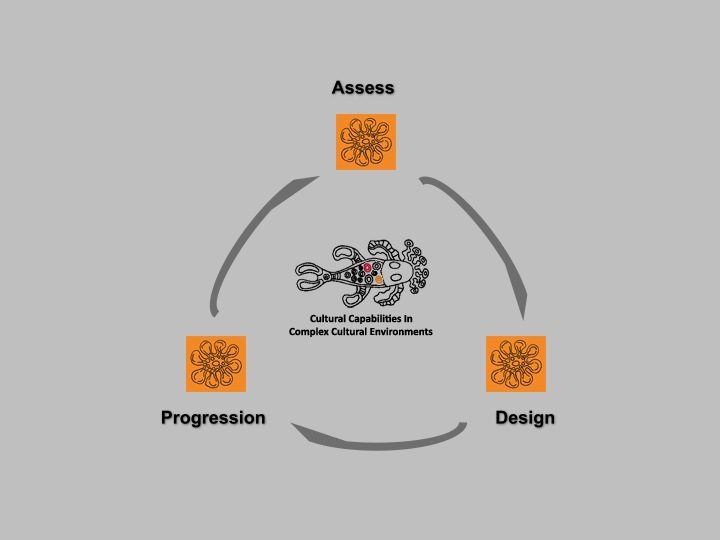 Visual designs are created to capture Indigenous knowledge, its scale and components during consultation, focusing heavily on the complex cultural governance structures and processes that form the basis of decision-making in Indigenous communities and Traditional Owner groups.